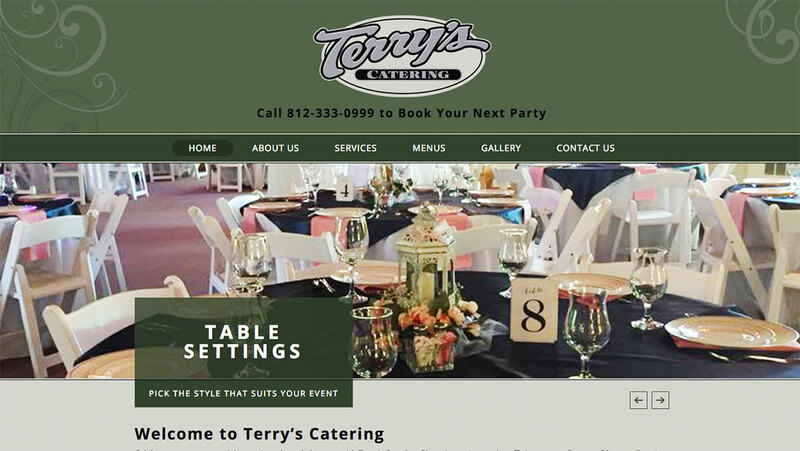 Celebrate your next special event in style and elegance with Terry’s Catering, Bloomington’s premier off-site caterer. For over 30 years, Terry’s Catering has been serving Bloomington and the surrounding areas with deliciously prepared comfort foods and sophisticated ethnic selections. Family owned and operated, we are dedicated to the mission of “Making Your Event Special” with first class service, savory food dishes, and elegant decor. Conveniently located near downtown Bloomington, Indiana University, Ivy Tech, and most of the industrial areas, our commercial kitchen and sales office is easy to find. From corporate functions, wedding receptions, and family gatherings; you can entrust your special day with Terry’s Catering. Through our honest approach to our customers’ needs, we have built a strong reputation in the community for making every special event a truly memorable experience. Whether it’s breakfast, lunch, or dinner, Terry’s is equipped to do small and large events. In the past, we have served as many as 8,000 guests and regularly serve groups of up to 300. As an approved caterer for Indiana University, Terry’s Catering can help with campus events, including parent’s weekends, recruiting functions, and other IU related events. For your next get together or special event, call Terry’s Catering at 812-333-0999 and let us take care of all your catering needs!